The Himalayan region – Explore, trek, camp and soak in the spirit of the Indian Himalayas. Bike in Leh & Ladakh, be spiritually uplifted in Rishikesh, and return rejuvenated. Orissa, Varanasi – Visit the temples of Khajuraho, a UNESCO World Heritage Site. Give in to the beauty of the Ikat weave. Drench your soul in bliss at the Ganga Aarthi in Varanasi, one of the holiest cities in the country. 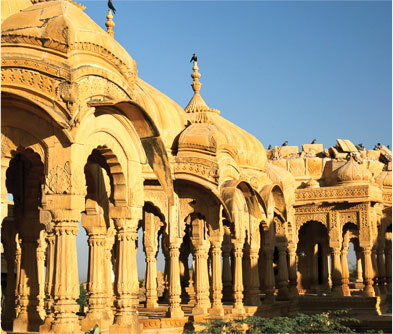 Rajasthan – The Royal Bengal tiger of Ranthambore, the palaces of Udaipur, desert safaris in Jaisalmer, and exotic Rajasthani cuisine – live it up king size in Rajasthan! Delhi, Agra – While time worn relics and buildings greet you at every turn in Delhi, the alluring beauty of the Taj, especially by moonlight casts a spell that is hard to break. Kerala, Karnataka, Tamil Nadu – The majestic tuskers and backwaters of Kerala make for a relaxing getaway. Tamil Nadu satiates the culture and history buffs with its stately temples, music and art. From wildlife and archaeological ruins to temples and palaces, Karnataka flaunts it all. The art of savoring this sub-continent is what we at Footprint, proudly specialize in.